Evaluate gamma compensation at a glance! Can we evaluate if gamma compensation has been applied correctly, knowing the color and texture objectively? Yes, let’s see how with some simple examples. 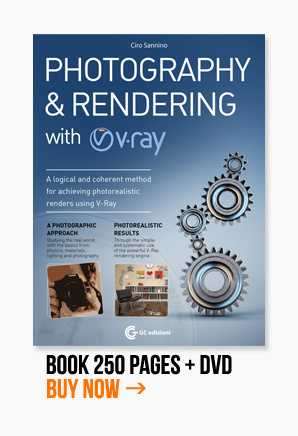 Motion blur is due to rapid movement or long exposure: let’s try to verify if V-Ray is so real as they say. LESSON #40: In this lesson I’ll show you how to create bloom and glare effects with Lens, how to save time with lower GI and a solid workflow for Post Production with render elements. LESSON #39: In this lesson I’ll show you a procedure to control and create amazing complex materials. Follow my suggestions and the complex materials will be suddenly easy to understand. LESSON #38: In this lesson I’ll show you a simple trick abour framing and how to correctly approach to the studio lighting. Save your time and heads straight to the result.